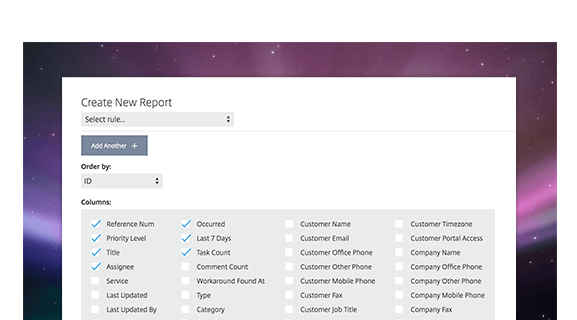 Run automatic and custom reports on your services, users and customers. Know your services inside out. Are you living up to your service-level agreements? With Service Desk, you know the answer. Your incident statistics are available at a glance, and you can dive deeper into all of your account activity to understand just how your team is doing. Pick a report or create your own. Good reporting ensures good service. Service Desk makes it easy to keep an eye on your support team’s performance. With reports for SLA compliance, satisfaction ratings and more, you’ll understand what you’re doing well — and what you aren’t. Use that information to take action and provide better support to your customers. Take your report to go. You can export your results as a .CSV file in seconds, and it’s up to you which numbers you want to include. You can also email reports to yourself with a click. Even easier, you can set them to run automatically and send the results right to your inbox on a recurring schedule. 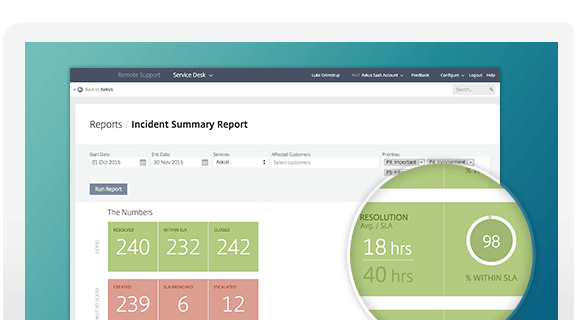 Record your teams' hours on incidents, problems, changes or releases.